"The BCG-treated type 1 diabetic subjects at year 4 after glucagon challenge had a negligible to no return of clinically significant C-peptide. " "The human pancreas after BCG even at four years after repeat vaccinations did not secrete significant insulin as clinically measured by C-peptide." "It is now an accepted approach to evaluate endogenous insulin secretion by measuring C-peptide levels (with highly sensitive and normalized measurement methods) in response to a physiologic stimulus (liquid mixed-meal) under standardized conditions." "differences in HbA1c between treatment and placebo groups are minimal and thus cannot serve as robust measures of efficacy"
Efficacy endpoints. Stimulated C-peptide response is accepted as the regulatory primary endpoint because it is a direct measure of reducing the hormonal deficiency state of T1DM. Secondary endpoints and their considerations. HbA1c is the gold standard measure of glycemic control, but it is an insensitive measure of improved beta cell function resulting from an intervention. Good recap on the failure of BCG to be seen as a cure due to no c-peptide improvement. HOWEVER, I disagree strongly about a 0.8% A1C drop being worthless. Other drugs provide similar benefits but cost much, much more than BCG, so in terms of effectiveness / dollar BCG is a thousand times better. A single dose costs pennies and two of them give a 0.8 drop in A1C for 4-6 years? Sign me up! There is also no reason the benefits can't be combined with those other therapies. As I have done, I have proof that of temporarily increased c-peptide levels via GLP-1 (and possibly verapamil, not sure) being taken consistently, and then not taken for a year and seeing the numbers drop back down. Now I'm back on GLP-1 again and expect my c-peptide to rise again. See CureType1 blog. If you're so concerned with c-peptide results, as you should be, for evaluating a "real cure", you should also note that A1C is a big deal. 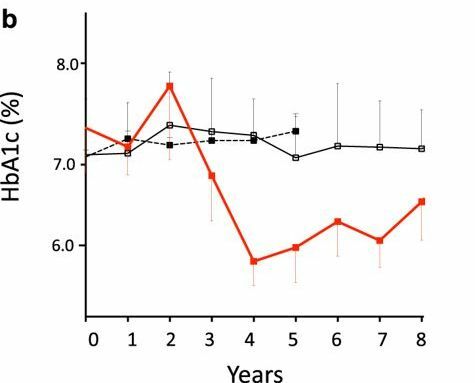 And a 0.8 drop in A1C, if it were indeed real (given the small sample size in this study, who knows), at the cost of a couple subcutaneous injections and then doing nothing but wait for it to kick in a couple years later, is what I'd call a wow-therapy. There are no negative side effects to BCG, they give it to babies, and it costs pennies per dose so you really think a 0.8 A1C drop isn't a big deal? That is absurd. I know this blog is focused on evaluating cures, and you're right this isn't one, because of no c-peptide improvement, however regardless of the theory behind why it improves A1C it does in fact do so, and delivers significant benefits on the order of what other, very expensive drugs that need to be taken daily or weekly achieve, and last half a decade or more without any intervention. And many of those drugs like SGLT-2 can have significant or even deadly side effects like DKA (if taken incorrectly and not measuring ketones). GLP-1 can make you nauseous and have headaches, plus its effectiveness wanes over time just like your critique of BCG here. So why the double standard? GLP-1 is the preferred treatment of choice for type 2s instead of insulin, and it's in the process of being approved for type 1s too (it works wonders for me). The cost factor of A1C reduction per dollar might not matter to you, but I suspect that's a question of perspective, i.e. your privilege is showing here. Price does matter to many type 1s, if a few pennies could drop your A1C by 0.8 for several years, are you kidding me that we shouldn't take it? Given not only the price, but the near-zero risk involved. -0.8 would bring someone from a mid 6 range into a normal range, reducing risk of long-term complications and/or reducing the need for insulin. You also can't argue that reduction in A1C, as you've done here, doesn't imply a reduction in insulin requirements. Because if I keep my A1C target the same, and got BCG injections potentially reducing that by 0.8, then I could reduce my insulin needs and thus hypo frequency "for free". Hypoglycemia is a serious and deadly risk for type 1s, so anything that improves A1C without impacting insulin needs by necessity implies, through basic logic, that insulin needs to maintain the same A1C are reduced. Most of those other drugs aren't even indicated for type 1s yet, despite offering significant benefits. I can't get GLP-1 or SGLT-2 or TPP-4 on my government drug plan (here in Canada) because those are only indicated for type 2s only, but I know for a fact that GLP-1 not only helps my A1C, but also boosted my c-peptide by a factor of 3 after taking it for many years, not to mention my weight, sleep, ability to digest food calmly and enjoy my life more. SGLT2 inhibitors: A1c improvements of 0.5 to 0.8 [r22]"
First off, CGM's are expensive and not available to every type 1, even though who have private insurance. Compare that to BCG, which delivers superior results for pennies with zero side effects. Next, Semaglutide is EXPENSIVE. I have some samples of Ozempic, which cost 1400$ a month without insurance. And guess what, as a type 1, you can only get these off label and most of the time even private insurance won't cover it. I was lucky because I had one that allowed me to fill scripts for Victoza and later Trulicity despite being type 1, and that did improve my A1C and c-peptide, so yes, definitely better than BCG. But why is it either / or? When I lost my private insurance I lost my GLP-1 last year and my c-peptide dropped by a factor of 3 since then. Yay for GLP-1 being awesome, too bad it's only approved for type 2s. So again, you're not being fair here. If you look at the effectiveness of BCG vs its price, and consider that SGLT-2 has nasty side effects like DKA which can be deadly, on top of its price and having to take it every day, you'll see why I don't think your critiques here are impartial or logical. You don't have type 1 diabetes so you're maybe not aware that even GLP-1's benefits, as great as they are, diminish over time just like BCG. So you're critiquing BCG as a therapy whilst ignoring all the significant downsides to those other type 2 drugs. GLP-1 can also make you puke, get headaches, and feel lethargic. Not so with BCG, maybe some mild flu like symptoms for a couple days then years of A1C benefits. So you're right that it's not a cure, absolutely, but wrong that it's not something to get excited about in terms of one tool in your toolbox for long-term therapy. A lower A1C through a drug would allow you to maintain the same A1C via less insulin, thus less hypos which, again, can have deadly consequences. Again, you don't seem to value a reduction in hypo frequency because you don't have type 1 diabetes yourself, otherwise you'd have realized my very valid critiques before posting this very one-sided and frankly biased review here. I do not think an 0.8 drop in A1c is worthless. 1. It was not a consistent 0.8 drop. At first the A1c was worse, only later was it better. That could be random fluctuations rather than consistent results. Other treatments aimed a lowering A1c numbers, lower them the entire time they are used. Sure it's cheap, but you need to tell the patient "It'll make you worse for the first 2 years". I think that is a tough sell to patients, but it is also hard to explain as science. 2. These results are from 3 or 12 people. That is a small number. Type-1 diabetes cures require two different 300 person trials. Type-2 diabetes treatments are usually tested on even larger groups. Even if the results are perfectly accurate, this is a long way away from general use. 3. This phase-I trial was never designed to report on A1c numbers. If you look at the original trial design, A1c is not part of it. For me, that raises considerably the chance that these results are wrong in some obscure way, simply because the trial was not designed to report them. But we'll see how things are going in 2023. Remember the results we see now, in 2018, are different from the results that were seen in 2012. Maybe the results in 2023 will be different yet again. Joshua, I also found almost nothing to be excited about here. In my mind it is mostly hype with little promise. Not uncommon from this source. I agree with you both that a 0.8 drop in A1C is only something to get excited about if it were 100% validated to be a causal factor, via a much larger sample size. Also, apologies if my tone was off, type 1s can be rather prickly at times (I know several, who, after decades with the disease develop a brusque, abrasive personality due to internalized rage which boils over periodically). I am generally a big fan of your blog even though I disagree with your conclusions or emphasis sometimes. Therapies such as smart insulin would be just as good as a cure to me, and every little bit of A1C drop helps, so lowering it for cheaper, longer, and with less side effects is certainly a big deal, to me. I'm taking verapamil and have been for years, but I think whatever benefits I am getting from it (if any) depends on GLP-1 as well to really bring the CP numbers up substantially. It is also one of those super cheap, super safe drugs, that is mostly well-tolerated (not by everyone). Much cheaper than GLP-1 but of course we'll have to see how good the numbers are for verapamil first. My endo also told me that metformin boosts endogenous GLP-1 by 25% (and thus should improve CP theoretically). I know metformin lowers A1C in type 1s too (by 1.1% IIRC) but I was also curious about any verified effects on c-peptide through large-scale studies. It should be clear that c-peptide values in long-term established type 1 diabetics can change, and actually be clear about what drugs do have a real, clinically proven ability to do so. Even a tiny bit of c-peptide improvement also implies improved alpha cell signalling so less hypo frequency and severity due to low-glucose triggered glucagon release on demand, which depends on working beta cells which are in charge of not only producing insulin, but measuring blood glucose. I got the paper, it looks like there's some good benefit but the sample size was pretty small too. I don't understand how come they couldn't get tons of type 1s to join up, it's ridiculous. Thank you for this evaluation. It is the best summary I have seen yet. I have the Verapamil paper, and it is on the list to cover in the blog, but I'm a couple of papers behind, as usual, so not sure when it will come out. I agree that there is nothing to get excited about in this latest installment of the Faustman saga. The best results she got were a 20% reduction in A1c, but if that were to translate into a clinical effect of being able to draw the insulin syringe down 20% less far to achieve the same outcome, what good would it be? The disease would still be there. Also, while BCG itself has been proven safe in its short-term uses for tuberculosis and bladder cancer, it is most definitely not safe in its side effect of increasing tumor necrosis factor levels in the body, especially in patients with a known predisposition to autoimmune diseases. Since for this treatment BCG would have to be taken long term, patients who have already suffered a disease from an abnormal immune system would be living permanently with an additionally altered immunity, which would be risky. Finally, there has been a fairly revolutionary study recently of 2700 type 1 diabetics followed for 7 years in Europe which showed that all-cause mortality increased in those who reduced their average A1cs below 7% just as it did for those who had average A1cs above 10%. This extends the well-established evidence from 2008 for type 2 diabetics, that lowering A1cs below 7% is counterproductive, to type 1 diabetics, and raises the question whether BCG and interventions like it have a point? Since many studies show that genetic and autoimmune factors contribute to causing diabetic complications, with diabetic nephropathy heavily determined by genetics and diabetic neuropathy heavily determined by continuing autoimmunity, the whole fixation on blood sugar management 'cures' may be misguided.